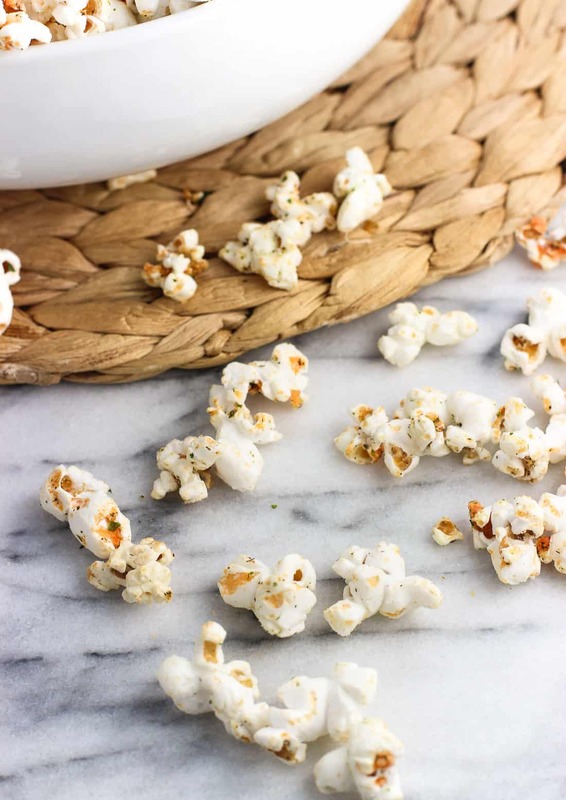 Buffalo ranch popcorn is made right on the stovetop in no time, making this a quick and healthy snack recipe! 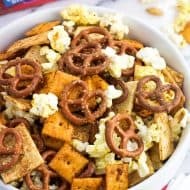 It’s popped in coconut oil and easily flavored with ranch seasoning for zippy flavored popcorn that isn’t greasy at all. Remember that homemade ranch seasoning I shared last week? It didn’t take long before it turned into one of my favorite popcorn toppings. To be honest popcorn and I go through phases. 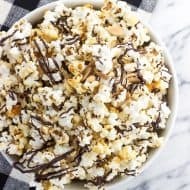 There are times when I’ll make a batch a day (we’re both big fans), but then after awhile I’ll somehow forget about it and go weeks without thinking about popcorn at all. Probably because I got distracted by no-bake chia bars or whole wheat cinnamon sugar pita chips or another tasty + healthy snack, but still. The number of times when rummaging through the pantry that I happen upon a half-used bag of popcorn kernels and go “oh yeah, popcorn!” is a little silly. But mixing up a fresh batch of ranch seasoning called for homemade popcorn in a big way. 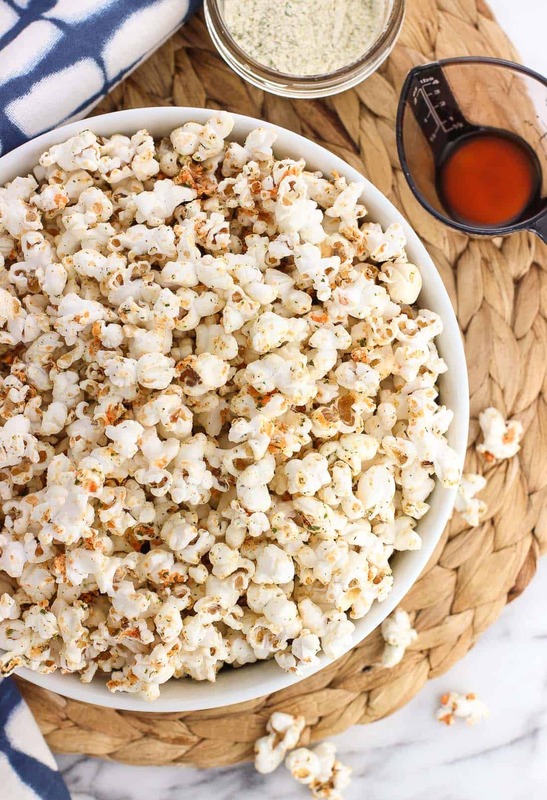 This buffalo ranch popcorn has a tangy ranch flavor that works so well on popcorn, and is a natural pairing with the zing from buffalo sauce. Because basically if there’s an option of putting buffalo sauce on something, I’m not not going to take it. See here, here, here, here, and here. Popcorn is a great snack because it requires a lot of chewing for not a lot of calories, which seems to trick my brain into thinking I’ve eaten more than I have. 🙂 Plus popcorn has a fair amount of fiber, making it a smart choice for holding you over to your next meal. 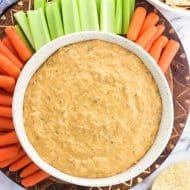 It was tough for me to determine a serving size for this recipe because we can do quick work on a batch, but I’m going with this yielding three servings for a regular-sized snack. Not saying that two of you couldn’t polish it off in no time, but any leftover popcorn can be stored in an airtight container for several days. 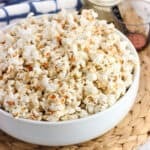 I use refined coconut oil for my popcorn, especially with a flavor like buffalo ranch as it wouldn’t mesh with the slight coconut flavor virgin coconut oil can impart on foods. Use whatever variety you prefer. I recommend heating the buffalo sauce slightly in the microwave before pouring it over the popcorn so that it’s thinner and doesn’t glob on certain areas and make them too wet. Thinning the buffalo sauce helped pour a thin drizzle to more evenly coat the popcorn. Add coconut oil and 3 popcorn kernels to a stockpot set over medium-high heat. Watch as the coconut oil melts and wait until the first kernel pops. Immediately once that happens add the remainder of the kernels to the pot and put the lid on it. Holding it by its side handles, shake the pot side to side on the stovetop as the kernels pop. 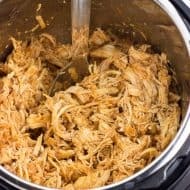 Once the popping slows to about 5-6 seconds between pops, remove the pot from the heat and crack the lid to vent so the steam can escape. 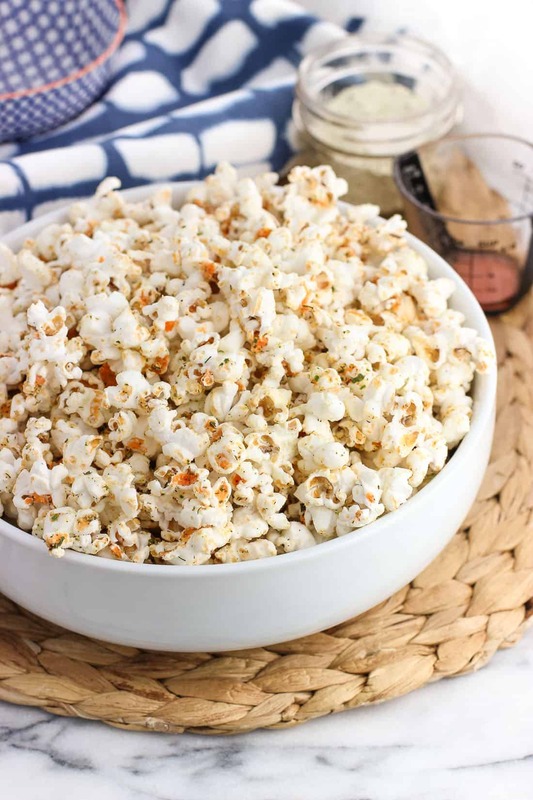 Sprinkle ranch seasoning over popcorn and shake to coat. 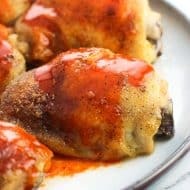 Heat buffalo sauce for 10 or so seconds in the microwave so that it's warm. Drizzle over the popcorn and shake to disperse. Store leftover popcorn in an airtight container. This is such a great snack! 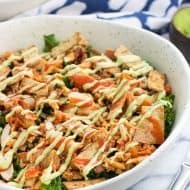 So flavorful and easy to make on the stove! I’ve never made popcorn on the stovetop, but now I want to try! These flavors are also fabulous. Who doesn’t love ranch?